The long days of summer offer the perfect opportunity to explore new possibilities and techniques with fabric and thread. And you don’t need to leave your own studio — why not schedule a “staycation” and try something new? The June/July 2017 issue of Quilting Arts Magazine provides loads of inspiration from top fibre artists for you to explore in your own art camp. Set aside a few hours for you and make a commitment to play. Create beautiful felted and marbled wool with artist Vickie Clontz. Learn about dyeing fabric with Susan Purney Mark. Explore painting a cat’s eye with Susan Brubaker Knapp. 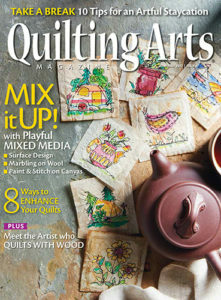 Be inspired by the charming mixed media “quilts” made on tea bags by Libby Williamson. Meet artist Laura Petrovich-Cheney, the artist who quilts with wood.